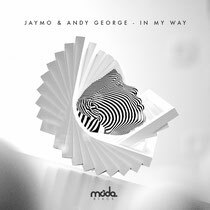 Jaymo & Andy George offer up the ‘In My Way’ EP via their Moda Black imprint this October, comprising two original tracks from the duo. The track takes the lead, baring all the hallmarks of J&AG’s recent products. Laden with warm textures and oscillating toplines, the first half of the track sets a seductively mellow foundation. Emotive melodies, uplifting strings and warm bass take prominence, before looping keys, vocal edits and soaring arpeggios create a feel-good moment of universal effect. On the flip, J&AG demonstrate their love for less club-orientated music, embracing the freedom of the B-side. Ice Cubez is a low-slung slice of sidewalk funk that melds quivering chords, guitar licks and ambient street sounds to create a song that will have you reminiscing about BBQs, block parties and hot pavements. This Autumn will see Jaymo & Andy George take Moda Black on tour around the UK and Europe, with guests such as Fur Coat, Justin Martin, Andhim and Ejeca joining the MB crew in London, Glasgow, Paris, Amsterdam and beyond. February 2015 will mark the second edition of Little Black Book, this time curated by one of the world’s most illustrious and diverse electronic music outfits. My family every time say that I am killing my time here at net, however I know I am getting experience daily by reading thes good content.